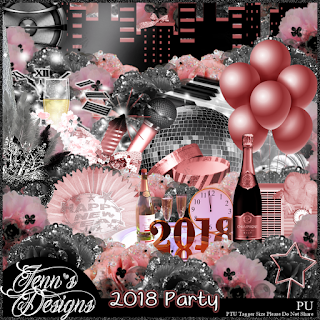 2018 Party is a gorgeous New Year themed scrap kit by designer Jenn’s Designs. This scrap kit contains 105 Elements and 10 Papers. 2018 Party holds so many possibilities for your New Year creations. It is a must have in your scrap kit library. PTU For Personal Use Only and Not To Be Shared. Exclusive to ScrapsNCompany. Exclusive Match for New Year Girl 1 ©Julsy; however, you can use any tube of your choosing. I chose a gorgeous tube ©Lysisange to create a timeline set for your viewing. You can purchase 2018 Party HERE.